People drink coffee. People love coffee. Coffee has become a subject of worship in the modern World. Of course, we are joking, however, behind every joke, there is some truth. Just imagine your day. We bet, you start it with a cup of aromatic coffee, as well as sip on a huge mug of a lavender tea before going to bed. Believe it or not, but seven billion souls are performing these two rituals every single day. For that very reason, you can see the boom in the beverage sphere these days. 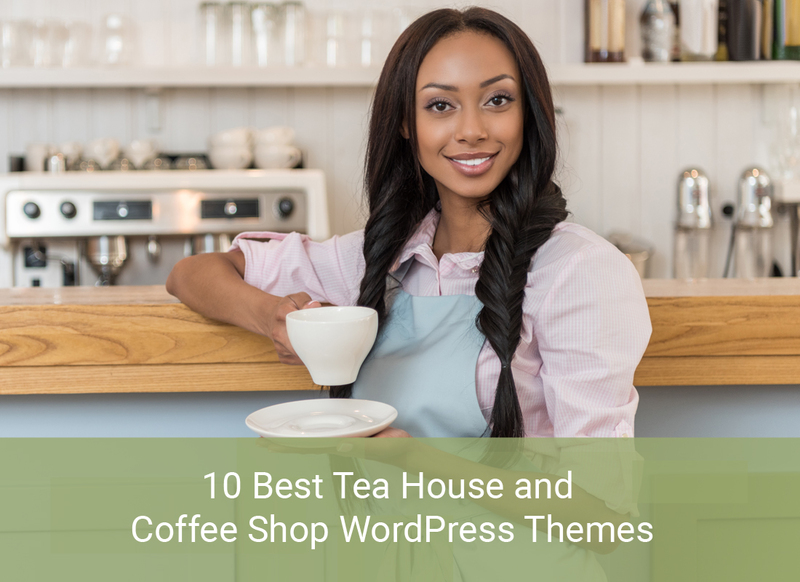 If you want to take a yummy piece of this business pie, you need to consider a tea house and coffee shop WordPress theme purchasing. As the theme is expanding very quickly there is not much time to procrastinate creating a custom design for your website from scratch. The WordPress theme would come in handy for those, who haven’t seen the website code at all, as most of the ready-made themes come packed with a drag-and-drop content composer. Buying such theme you have the assurance the website covers all your specific business needs. 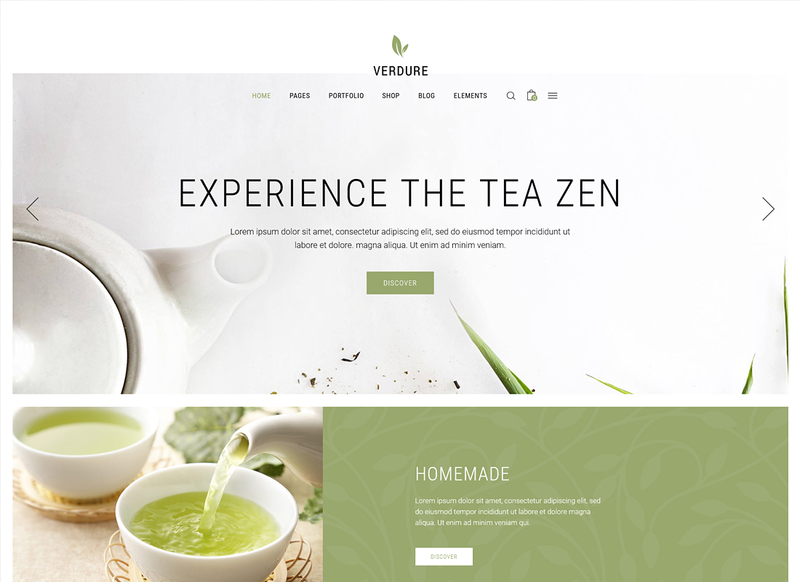 Also, the latest tea house WordPress themes and coffee shop WordPress themes include premium plugins, custom widgets, shortcodes, and other awesome options for a simple website customization. The themes listed below are specifically crafted for beverage services websites and come stuffed with tons of useful features. Whether you have a cafe or a coffee/tea shop you will find a superb solution for your niche website down below. Are you trying to find a way to promote your tea house? If you are a long time participant of this niche you may know customers appreciate artistic and authentic places. While you are running a tea house, you need to craft a neat and classy website to make sure you complete the quest of the effective online representation. 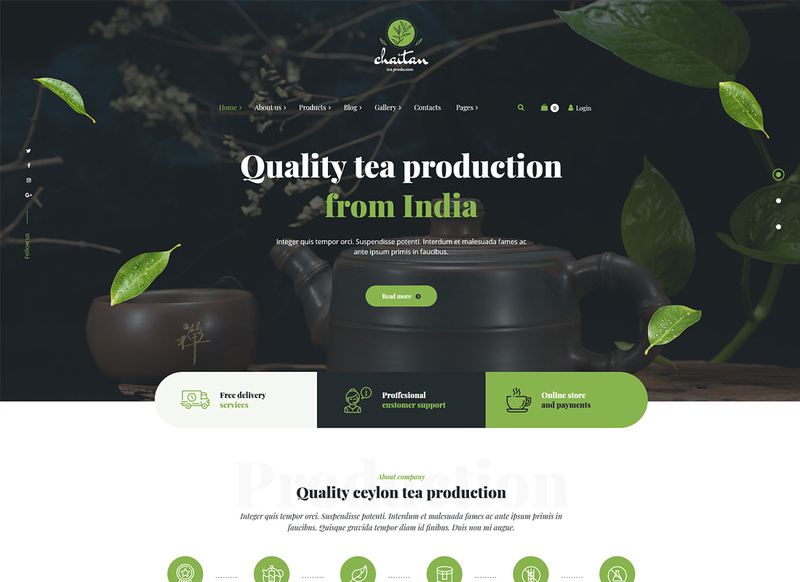 Thankfully, there are such tea house WordPress themes like this one which will help you to launch a website. Picking a specific theme dedicated tea house you get all the content issues covered as it already comes stuffed with relevant UI and UX elements. You will find, that all the themes in this showcase have ready-made homepage layouts, also come with tons of internal website pages, so you can use it applying minimum changes. All website pages are responsive and Retina-ready. 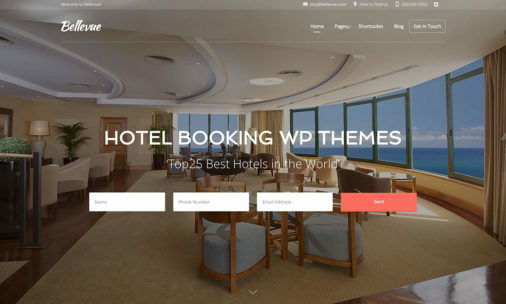 There are lots of WP themes that come responsive and look outstanding. Also, many themes offer a different way of the web design personalization. Of course, you can use a code to change the way your website looks, if you want to. However, there is another option for those, who don’t know the code, which is a drag-and-drop customizer. Using this tool you don’t need to look at the code at all but drag content around the website to obtain better results. 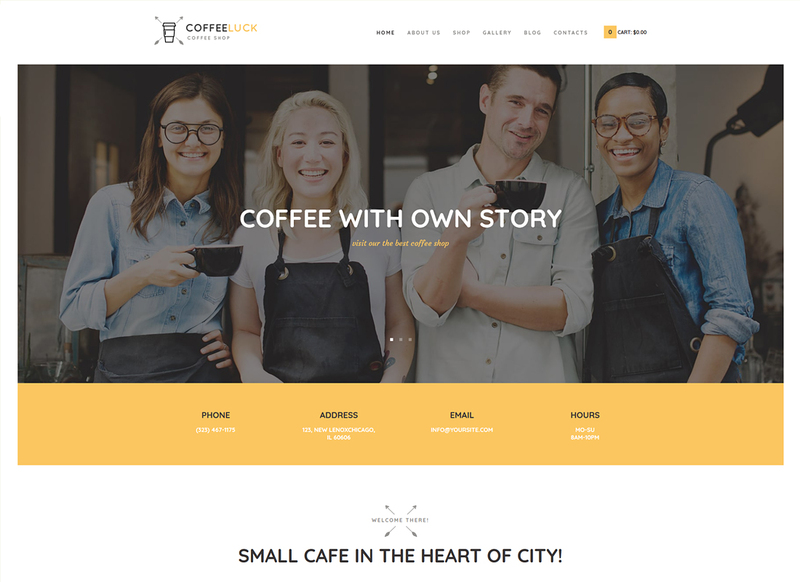 Coffee Luck is a stylish coffee shop WordPress theme suitable for a cafe or other food and beverage establishment. Each page of this theme is sucked with a content appropriate for a coffee shop. This theme is great for fast and effortless website launching. The level of your skills in website building doesn’t matter as the Coffee Luck theme has a visceral and comprehensive admin page full of advanced theme features. To boot, it is extremely easy to customize with the WPBakery Page Builder. Create an unlimited amount of website pages, demonstrate services, introduce your team, use handy plugins to establish a contact page with sleek contact forms. Another fascinating fact about the Coffee Luck theme is the compatibility with WooCommerce. This plugin is not just an instrument to create product pages, carts, etc. Using the WooCommerce plugin you can carry payments right through the website. Thusly, you will catch hot leads and convert them into buyers right away. This is one of that coffee shop WordPress themes with an excellent level of search engine optimization. Along with HTML code of the exceptional quality, there is a blog section that will boost your SEO even more. These days, being a company that supports or produces an organic, vegan, cruelty-free product is the guarantee of a success for any kind of business. Such an approach is also pretty much applicable to a tea production company. TheLeaf theme is a great match for your tea shop or tea house, as it supports a special atmosphere of a soulful ritual of a tea drinking. 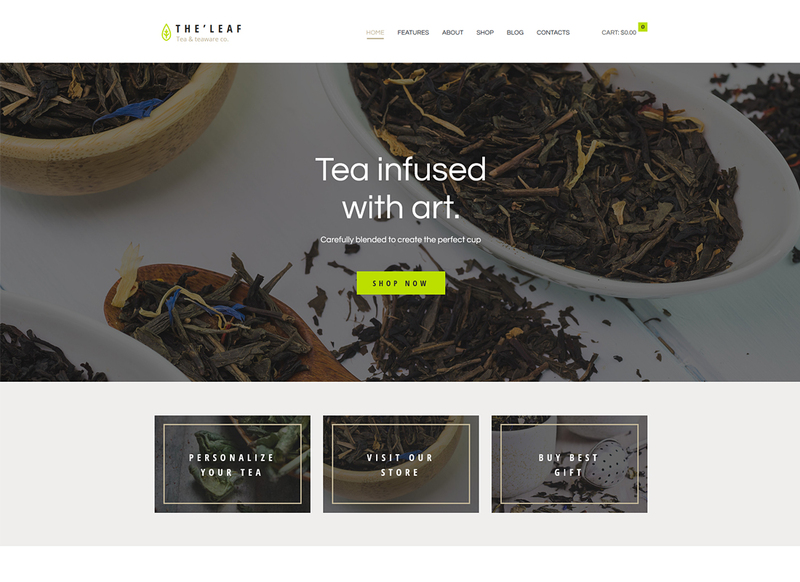 There are 2 Home Page layouts versatile enough to create a unique look for an online tea shop. You can use Visual Composer and Shortcodes to create content and change the appearance of your website on a drag-and-drop basis. Of course, there is an option to sell products using the website as this theme is WooCommerce-ready. Tons of product options will help you to represent your tea on a decent level. Also, you can enhance a visual part of your content using Google Web Fonts and Fontello Icons set. You will find all these options in the admin panel. 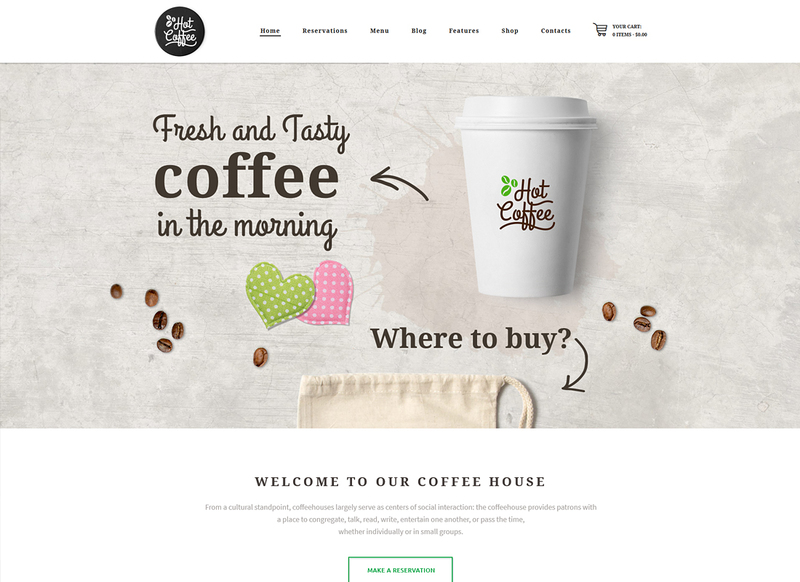 Hot Coffee is a WP theme for a bar or a cafe made in a clean and stylish design. 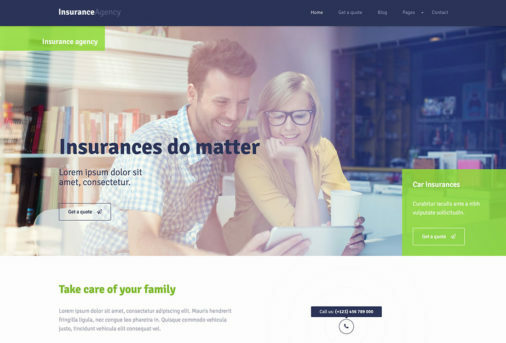 This theme features an astonishing homepage with options that work for the business representation best. You can publish eye-catching photos of delicious coffee drinks using Boxed and Wide pages layouts. All your content will work great on small devices as well, as such coffee shop WordPress themes as the Hot Coffee one come Retina-ready and 100% responsive. Even a ready-made demo is very flexible and you can change its settings whenever you need it through a handy admin panel. This theme has such custom widgets sets as Popular Posts, Recent Posts, Recent Reviews, Advertisement, etc. It considerably reduces the time you spend crafting website pages. You shouldn’t forget about the importance of a social media performance for any modern business. The Hot Coffee theme has social icons set, widgets for Twitter and Flickr, which will only benefit your cafe or restaurant. In order to help you avoid any mistakes during the theme customization, the comprehensive pack of a theme documentation included along with the great support of a professional developers team. The Chaitan theme was created to assist you while launching a tea e-store. It has 2 professionally designed home pages which you can use for any beverage related company. The fact it has only 2 predefined homepages doesn’t mean you have to limit yourself. The Chaitan theme is Visual Composer compatible and has 20+ Custom Visual Composer Elements. It enables you to play with a default design and use all of your creativity to turn your design ideas into reality. Some of the plugins that work with this theme show a great efficiency in terms of the content displaying. Such tools as scroll animations and Parallax effects allow you to create astonishing galleries and stylish blog layouts. The Parallax affects the theme navigation as well – or to be more precise – ensures a smooth scroll of your website, which makes your website much more pleasurable to explore. The Chaitan theme meets the highest SEO approaches. First of all, it is compatible with FireFox, Chrome, Safari, and other browsers. What is more, it is crafted with Bootstrap, which is a comprehensive framework that helps to achieve the best search engine ranking. 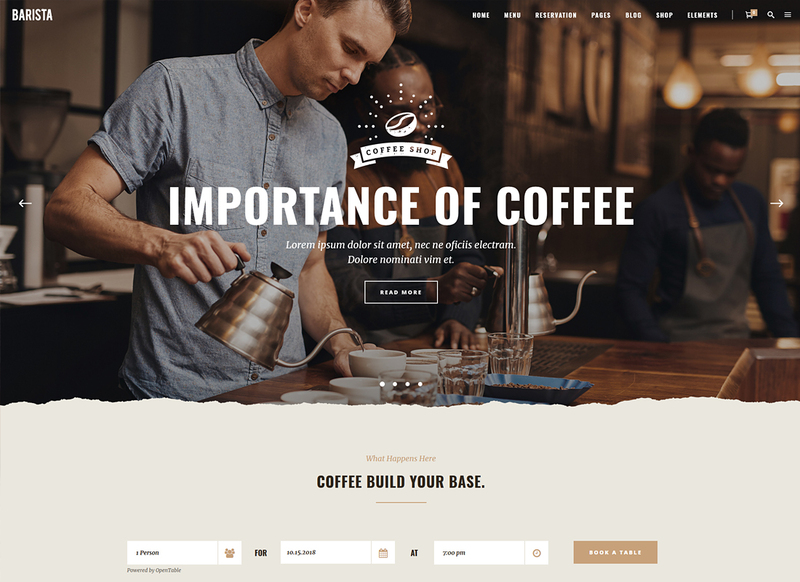 Mister Coffee is a noteworthy example of coffee shop WordPress themes that have all pages you might need. Using ready-made pages for testimonials, services, gallery, and blog you can be sure in the quality of a website design. All pages are mobile-ready and all images show the impressive payoff on all devices. Actually, this theme would be useful for any e-commerce project as it has all the WooCommerce features. If you don’t want to waste your time following boring instructions that support the theme installation process buy the Mister Coffee theme. Apart from clear video instruction, it has a One-Installation option. Thusly, pushing the Install button you activate the automated process of the theme data import, so you can use this time productively and work harder on the sustainable website content. One more part of the website building that worries each and every entrepreneur is the design customization. However, the latest coffee shop WordPress themes require no coding skills at all due to compatibility with drag and drop builders. Visual Composer is that exact tool that has tons of modules which anyone can use without any instructions. Thanks to the innovative technologies the website building doesn’t look as terrifying for an average user anymore. Do you feel like your tea house website looks outdated? 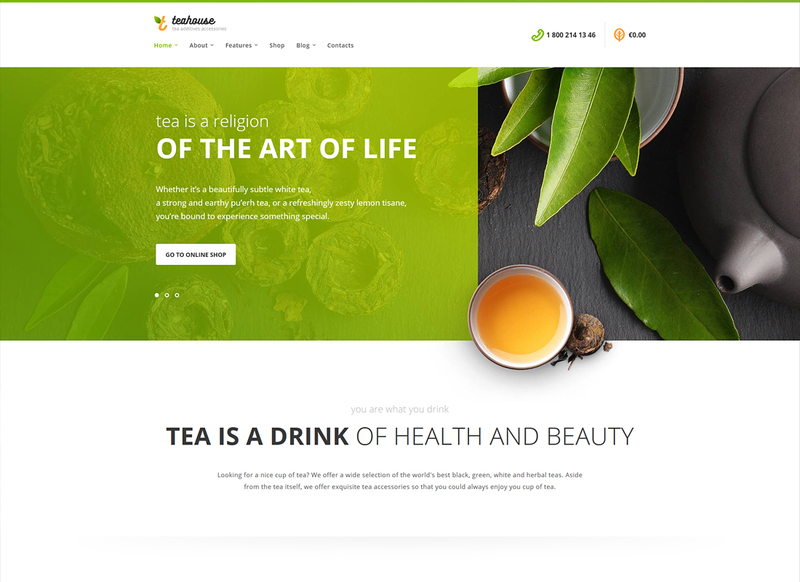 Fix the poor web design with one of tea house WordPress themes that we have prepared for you today. Verdure is a clean and beautiful WordPress theme drawn in bright colors aimed to help you highlight key points of your content. The theme includes Visual Composer and Slider Revolution. These premium WP plugins are must-have for those, who are barely familiar with the website building. The first one allows a codeless content creation. Speaking of the Slider Revolution plugin, you will be able to create gorgeous online presentations and decorate your homepage with beautiful animation. This theme will help you to make your tea house much more popular. First of all, you can use advanced blog settings to draw visitors’ attention with useful and captivating posts. Also, the best quality HTML/CSS code will help you to get top positions in search engines, thusly more potential clients will find your website. The Verdure theme is for those, who need to launch a website as quickly as possible, as the One-Click installation option will import all the demo data in few seconds. 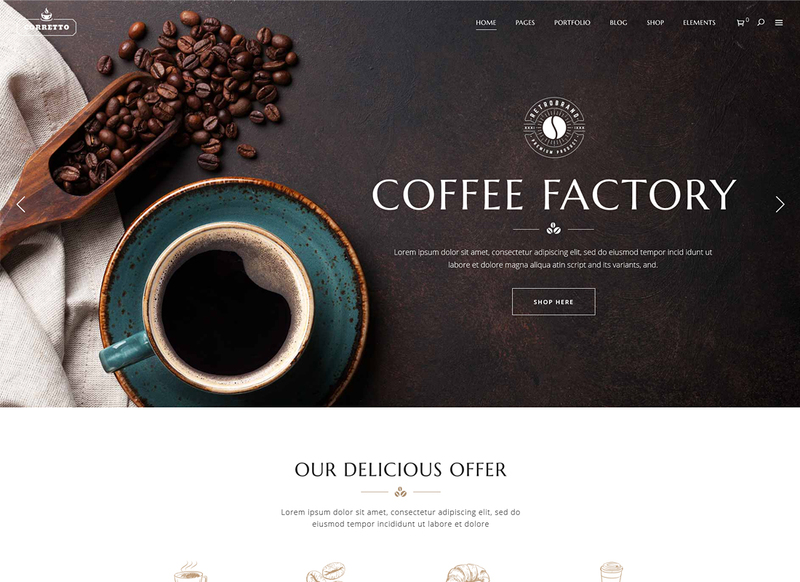 This coffee shop WordPress theme will attract new customers to your website with gorgeous slideshows made with Slider Revolution. This tool will catch the visitors attention from first seconds spent on your website. With this theme, you can represent beautiful photography tempting viewers with pictures of delicious desserts. This theme if versatile, so you can easily change or remove any element of the theme. You can display images, videos, text, and other kinds of content. Sometimes, the theme installation process turns into a real pain, but not with the Corretto theme. The One-Click installation option allows you to upload the theme data in few seconds. It is up to you decide if you need to craft custom pages or it is okay for you to use ready-made pages. 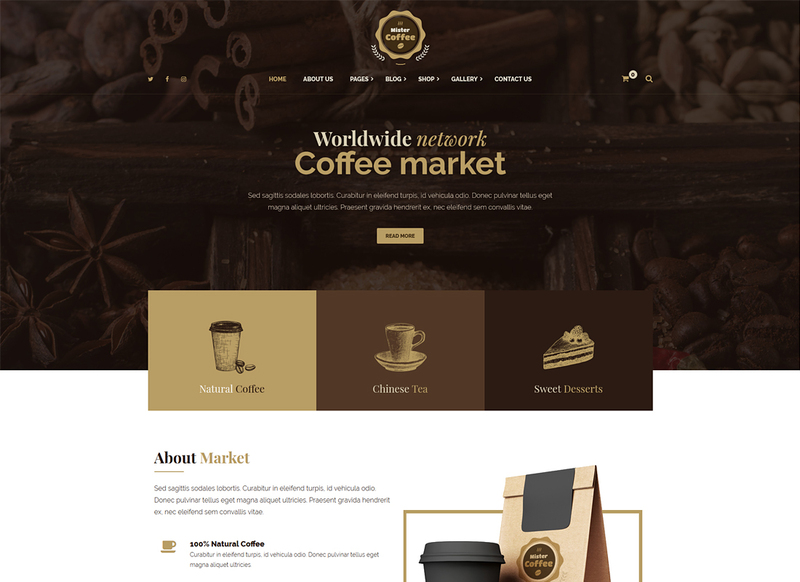 Anyway, with the Corretto theme, you will create a superb website for a cafe or a coffee shop. This theme has a variety of delicious templates and powerful features for a business representation. Apart from the brilliant design you will stun your customers with an easy-to-use website navigation and provide them with the most pleasurable online shopping experience. Barista is a well-rated WordPress theme equipped with ready-made pages and stylish templates. Making of a beautiful website is so simple with 9 Homepages. Each demo has all the features to create a powerful website based on WordPress. When changing the appearance of the theme, you can use an admin panel full of these features. It doesn’t require any special knowledge, simply use your imagination to the website you are looking for. That is also fine to use one of the default demos. As all the demos are flexible and responsive. You can add buttons, change settings of the demo, use different fonts, and much more. The Barista theme is WooCommerce ready, so you can use it as a selling platform as well. You will get it with customizable header, footer, and sidebars. These website areas can be used for an effective advertisement or to display essential information about your company. Another customizable area of this theme is a menu. Actually, the theme supports Mega Menu, so you can stuff it with different content and organize it by categories and subcategories. Your clients will appreciate such a handy website menu. Let us introduce you the last item in this collection of tea house and coffee shop WordPress themes – Coffee King. It gives you a bunch of stylish options to promote your coffee shop on the web. If you are an owner of a cafe, that offers not only beverages but also chocolate delights there are tons of options for a content displaying. This theme has 32+ inner pages and 4 Homepage layouts. A wide range of drinks and desserts will look nicely organized in a Mega Menu. You can also introduce the theme of professional baristas and confectioners using Team custom post type. It will definitely improve the level of visitors confidence in your establishment’s robustness. 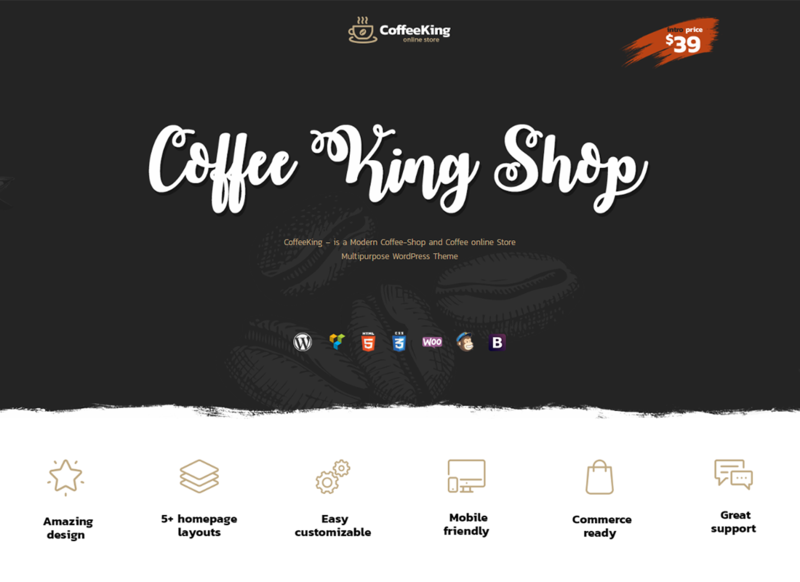 The Coffee King theme features Visual Composer, Slider Revolution, and the WooCommerce plugins. The best part of it is that you don’t need to pay for extra website features as these add-ons aimed to upgrade your website at no cost. Another benefit you get with this theme is an absolute customization freedom. The typography, color, settings, and the whole layout can be changed in a few clicks. This theme will help you to create your own brand and highlight its uniqueness in comparison with competitors websites.